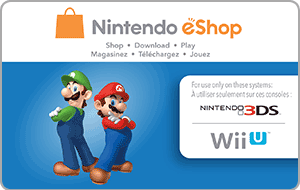 Nintendo eShop Card Canada- Delivered in Digital Format Online to your Email and PC Game Supply Customer Account. Buy Canadian Region Nintendo eShop cards for the Canadian eShop store. These cards are delivered online as a digital code. The product is available in the following denominations, $20, $35 and $50. Our company is an authorized Nintendo digital retailer, buy Canadian cards from a Canadian company, we are located in Calgary, Alberta, Canada. To redeem the card, go to the Nintendo eShop store and click "Add Funds", then select "Redeem a Nintendo eShop Card", Enter the 16-character activation code, then select "OK" to complete the transaction.